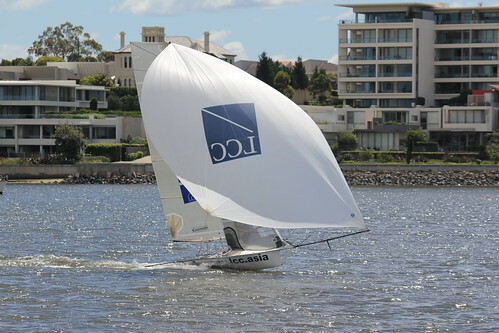 Lincoln Crowne sailed by Jonathon Temple and Richard Jones won yesterday’s Port Jackson Championship, putting on a great display of sailing in the shifting East South East breeze to win from start to finish. 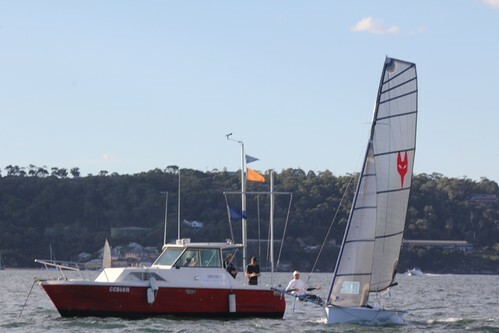 Gemmell Sails (Murray Press and Mitch Deane) picked up 2nd with Variety (Adam Forbes and Richard Johns) 3rd. Lincoln got the best of the start, aside from Variety who were a little too eager and where recalled, to lead the fleet up the first work into Rose Bay ahead of Garde (Brett Hobson & Macca Paton). 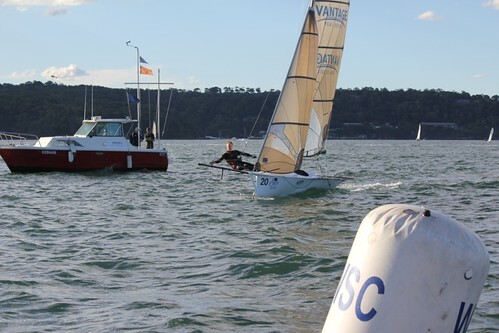 Gemmell rounded the top mark in 3rd place, and showed good pace down hill rolling past Garde. Garde pulled back into second at the bottom mark, two seconds ahead of Gemmell and 1 minute behind Lincoln. 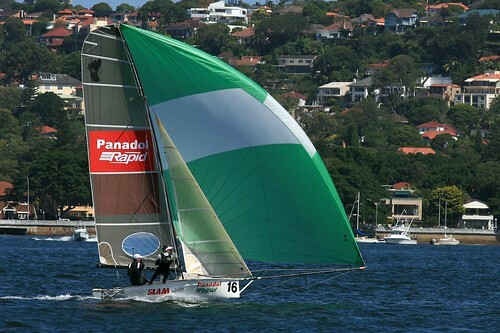 The Next pack to round were Variety making gains through the fleet after their recall rounding in between Hood (Dave Lusty and Glenn Farquhar), At Call (John Williams & Billy Lusty) with Vantage Real Estate (Andrew Obrien & Brett Phillips) snapping on their heels. Variety and Vantage made the most of a puffy breeze to pull away from Hood and At call at the bottom mark. On the work back to Shark Island, Gemmell sailed past Garde again, while Lincoln extended their lead. 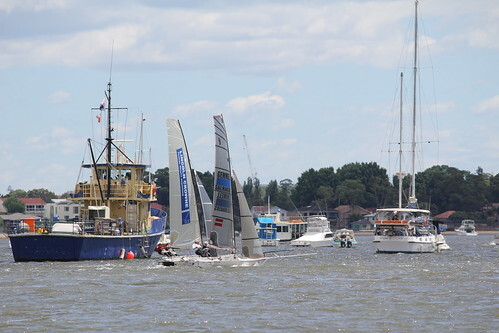 Vantage and Variety crossed bows a number of times before variety pulled away just before the Shark Island rounding. 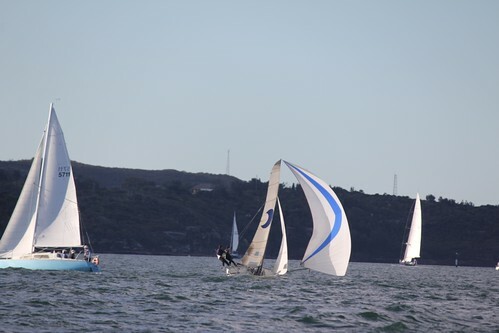 While the front 3 remained the same for the next run into Taylor Bay, Variety had a glamour downwind leg aided by a big puff making huge gains on the front 3 and putting daylight between them and Vantage. Gemmell Sails and Garde headed to the south of Shark Island on the work back to Rose Bay, while Lincoln went to the north. Gemmell made substantial gains, and were a mere 50m in arrears at the rounding mark. 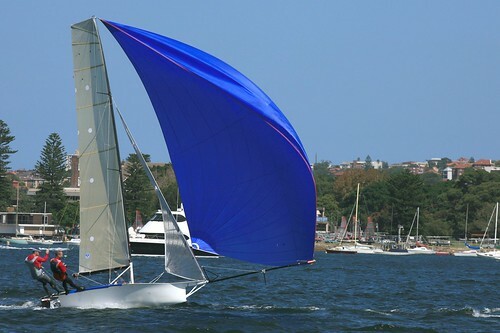 Lincoln covered Gemmell on the next run to Chowder Bay enough to hold them out. A spanner was thrown into the works on the final run, and the following beat, when a fuel ship tried to dock along side the container ship moored in the middle of the harbour. Gemmell, Garde and Variety all had to sail behind the ship, while Lincoln just crossed in front, but were then forced to give way to a ferry. Lincoln managed to remain composed during this episode and held their lead on Gemmell. 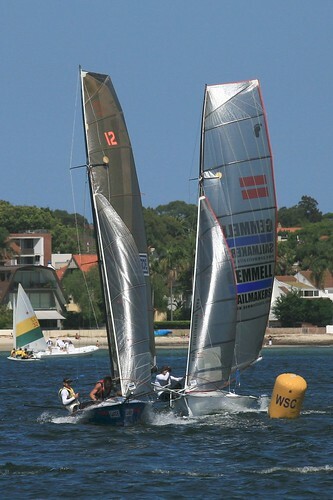 At the final windward mark, the top two positions were sewn up, however Variety were hot on the heels of Garde, only 5 seconds separating the two. An early jibe on Variety put them in prime position for the next gust, and on the short run to the finish they picked up 3rd place, 20 seconds ahead of Garde in 4th. Hood Sails won the handicap. 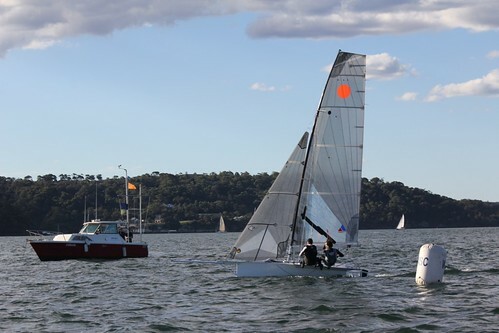 The Australian Championships are the next event on the 12ft Skiff Calendar, which will be hosted by Abbotsford over the Easter long weekend. 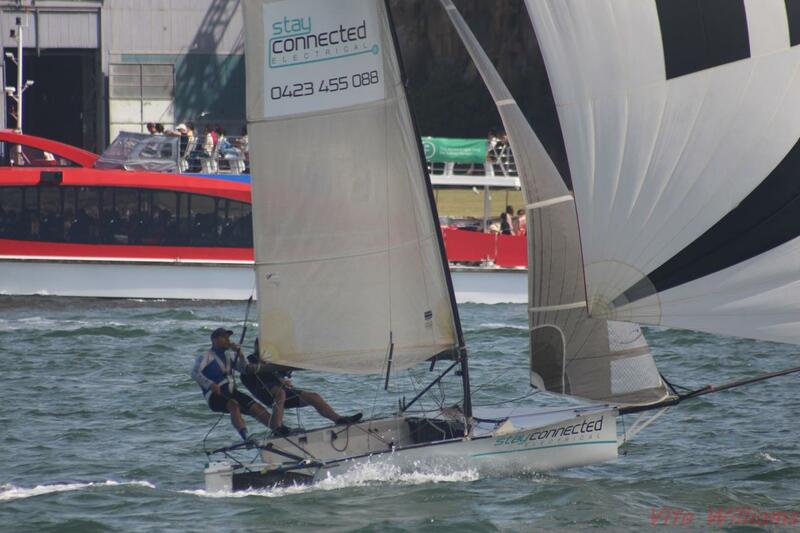 This entry was posted in News, Race Reports and tagged Woollahra on March 3, 2013 by Karmen. This entry was posted in News and tagged 2012 States, Woollahra on December 8, 2012 by Karmen. Garde (Brett Hobson and Brad Phillips) currently lead the 2012 Lincoln Crowne State Championships after winning all 3 heats at the weekend. 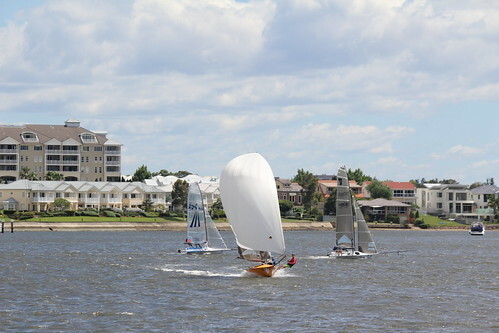 Heat 1 was sailed in a light Northly breeze. All skiffs electing the big rigs for the later afternoons long race. Geotherm (Scott Hobson and Mitch Deane), Skiff.org.au (Ben Faulkner and Renn Holland) and Variety (Adam Forbes and Richard Johns) all got great starts and looked to lead the fleet early on. Garde and LCC (Jonathon Temple and Richard Jones) hit the right side of the course and found some Northly pressure to get right in the mix, and round the top mark in that order. Variety and Geotherm dropped off the pace nearer the top mark, allowing Gemmell Sails (Murray Press and Scott Lanham) to round ahead. Rounding Shark Island was a little tighter than expected, with a slight shift to the east, and caused the top 3 boats to bunch right up. Up the next work, LCC picked a better shift to get ahead of Garde, however both skiffs rounded the top mark simultaneously. Gemmell Sails held 3rd place though had lost some time to the leaders. 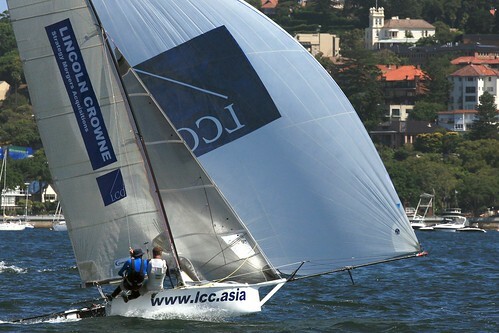 An outgoing ship split the two leaders, with Garde going west and LCC going east favouring Garde, to reach the bottom mark (and shortened course finish) first. 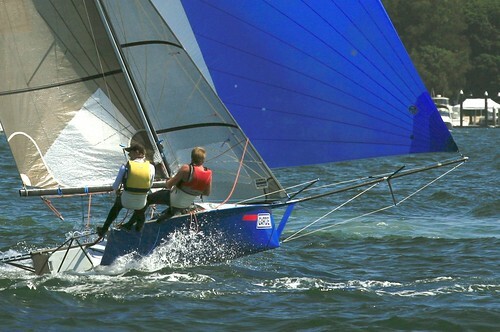 Geotherm recovered well to pick up 4th place, with Variety 5th and skiff.org.au 6th. 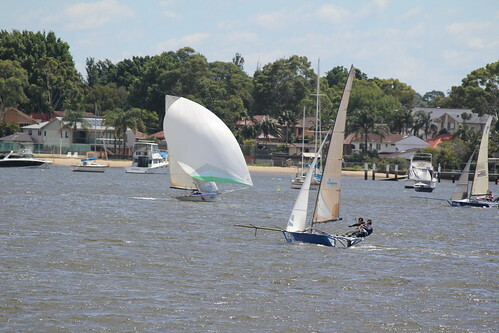 A mid to top end 2nd rig southerly blessed the race course for heats 2 and 3. Geotherm blitzed the start and the first work to lead the fleet early on, from Garde, Gemmell and LCC. Garde hit the lead down the run, LCC rounded the bottom mark just inside Geotherm, before breaking their tiller and capsizing. Geotherm caught Garde and threatened the lead before a Port Starboard altercation between the two saw them slip back to the clutches of Gemmell Sails. On the final work into Rose Bay, Geotherm went to the south of Shark Island to put time on Gemmell who went to the north. Garde maintained their lead to cross the line first, Geotherm second, Gemmell Sails third. Just behind the leading pack a battle emerged with Vantage Real Estate (Jack Winning and Brett Phillips) leading a group of boats including Hey Charger (Nick Bernard and Robbie Polec), Madonna (Dave Winning and Peter Bevis), Skiff.Org and Hood Sails (Dave Lusty and Glenn Farquar). Shark Island split this group up the last work too but Vantage Real Estate had the speed to take a deserved 4th place. 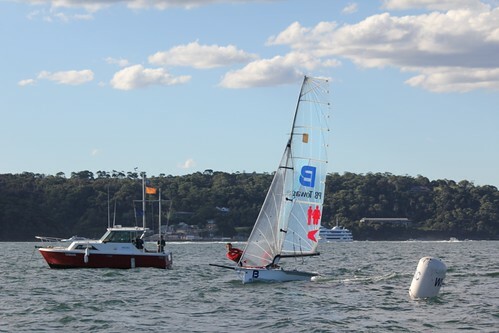 Garde got a jump on the fleet off the start line in heat 3 despite Hood Sails crossing the fleet with a brave port tack start. Garde stretched their advantage down the first run to establish a commanding lead. 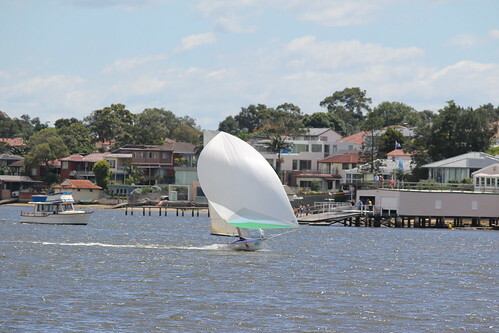 It was a group of Lane Cove boats that lead the chase for Garde with Gemmell Sails leading from David Winning in Madonna and Jack Winning in Vantage Real Estate. 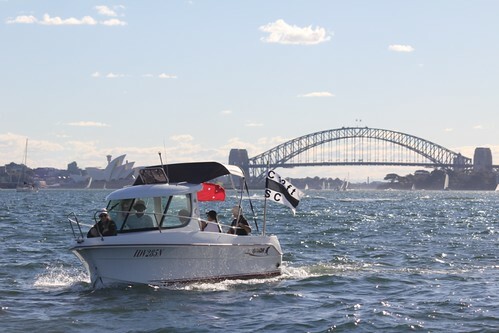 The breeze had eased a little but harbour traffic played a part as the skiffs criss-crossed the harbour. A few skiffs chose to risk the shallows around Shark Island on the run down to Taylor’s Bay but no one would get close to Brett Hobson and Brad Phillips in Garde. Gemmell Sails would take second again in front of David Winning in Madonna. 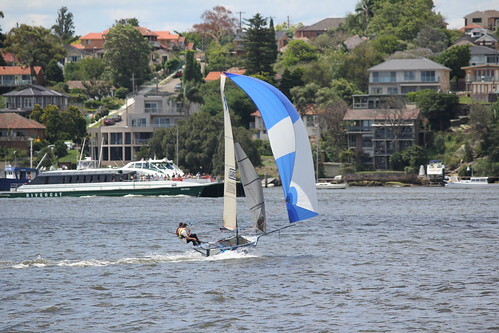 This entry was posted in Race Reports and tagged Woollahra on December 4, 2012 by Karmen. 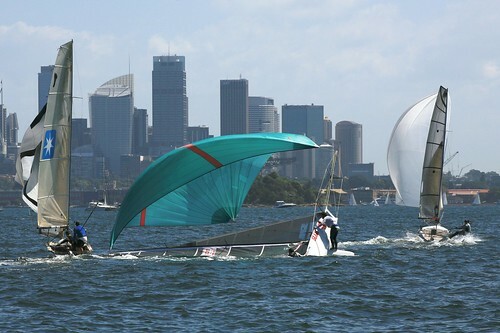 This entry was posted in News and tagged 2012 States, Woollahra on December 1, 2012 by Karmen. 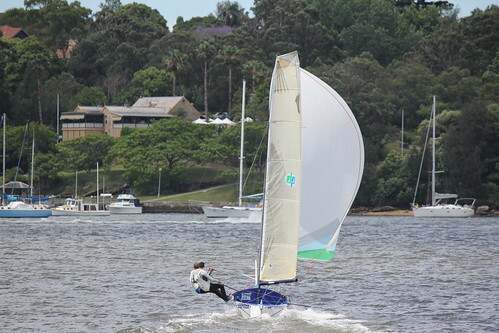 12’ skiffs will be competing in the NSW State titles over the next two weekends. 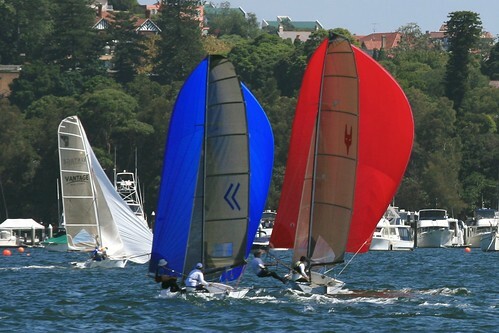 The series, sponsored by “Lincoln Crowne & Co”, will be held at Woollahra Saliing Club this Saturday and Sunday; and Lane Cove and Abbotsford Sailing clubs the following weekend. 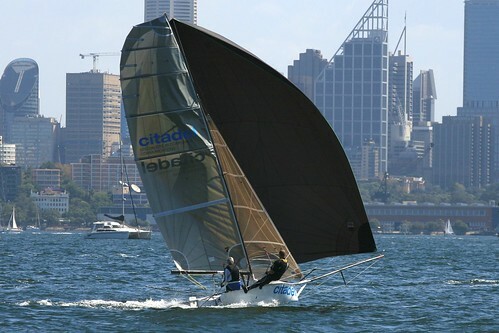 The NSW State championships also act as the selection series for the Australian team to compete againsed New Zealand, in the 12’ Skiff Interdominion Championship which is to be held in Brisbane in January 2013. This entry was posted in News and tagged Woollahra on November 26, 2012 by Karmen. Forecast was for SW big sail breeze, at rig choice time it was still exceeding big-rig range, but the fleet decided that it would fail in-line with the forecast. 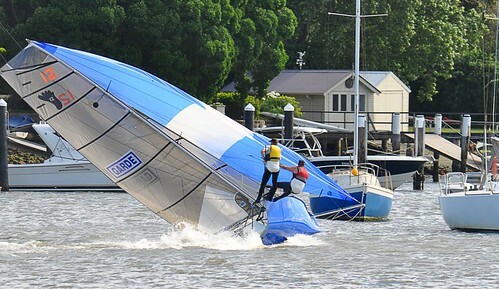 At the later stage, the Queenslanders with the skinny boats opted to make a rapid rig-change. The locals with the wider boats felt they were still in the right position, and kept the big-rigs in the boats. The PRO called a high-wind forecast, and like a mouse in the elephant enclosure, this caused a stampeded the rest. Murray first to go, called a change to second. All the others rushed to follow, then when they were fully committed Murray confessed to the “dummy”, and he had stayed with big-sail. Out on the course, his grit was rewarded, a sick breeze seemingly guaranteeing him the day, and with it second overall. Fleet got away in 10knot S-West with strong run-out tide, working shifts up to the top mark at Clarke Is. Just short of the island the breeze built rapidly to 15 knots, sending the front-runners, Gemmell Sails (“twinkle-toes” & Ben Gemmell) Garde (already having the series won convincingly, (Brett Hobson & Alex Johnson) Lincoln Crowne & Company (Jonathan Temple & Richard Jones) and PB Towing (James “skinny” Flemming & Tristram Hamilton) down the harbour toward the bottom mark near Eastern Pile Light in Watsons Bay, all frenetically gybing to stay in the narrow columns of breeze. This 4 bunched Final Raceat the bottom mark, and spread the rest of the fleet out between Clark Island and Eastern Channel. 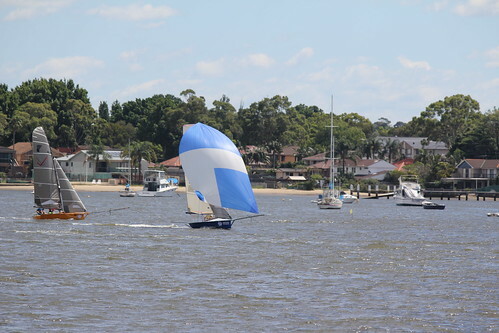 The breeze went really fickle on the work back, with Gemmell Sails pulling out, and Hey Charger (Nicholas Barnard & Robbie “Bruno” Polec) moving up on a westerly slant to take the lead, as Gemmell Sails worked further west to consolidate in the breeze. Garde in the east fell into a personal hole and parked, only metres from boats with pressure. Gemmell Sails & Hey-Charger got stranded in the channel off Bradleys as the breeze deserted them, allowing LCC and PB Towing to pass them in westerly pressure. Gemmell Sails re-took the lead at the top mark, and drove deep to the East in the pressure, followed by LCC and Garde, and this group followed the breeze down the east shore. The breeze then shifted back to the west, causing the eastern 3 boats to underlay the mark, and bringing Hey-Charger charging down over them in the west; Gemmell Sails & LCC held them off and were overlapped rounding the bottom mark. 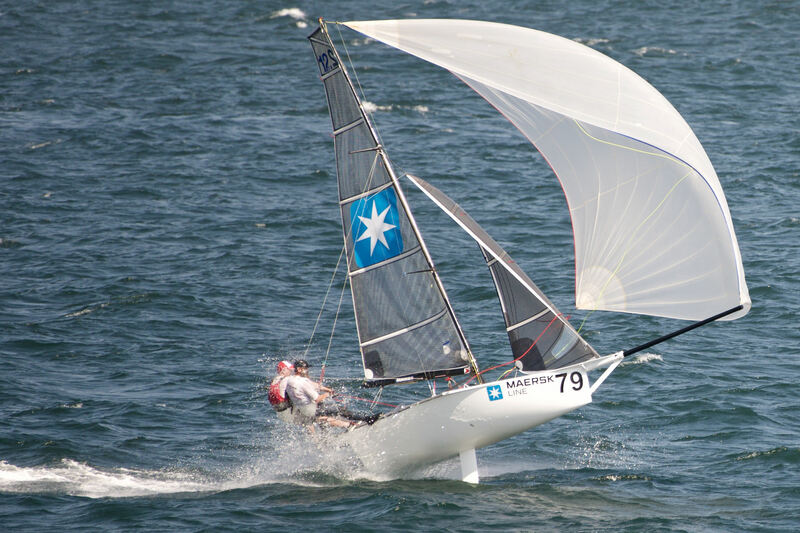 The breeze fell out again and allowed Gemmell Sails with the big-rig to extend again. Garde found another hole on this work and got dropped again. Breeze held steady for the rest of the race, allowing Gemmell Sails a comfortable victory, from Lincoln Crowne, then Hey Charger ahead of Garde. Regatta already won by Garde, todays result gave Gemmell Sails second overall, tied with LCC but got there on a count bck. 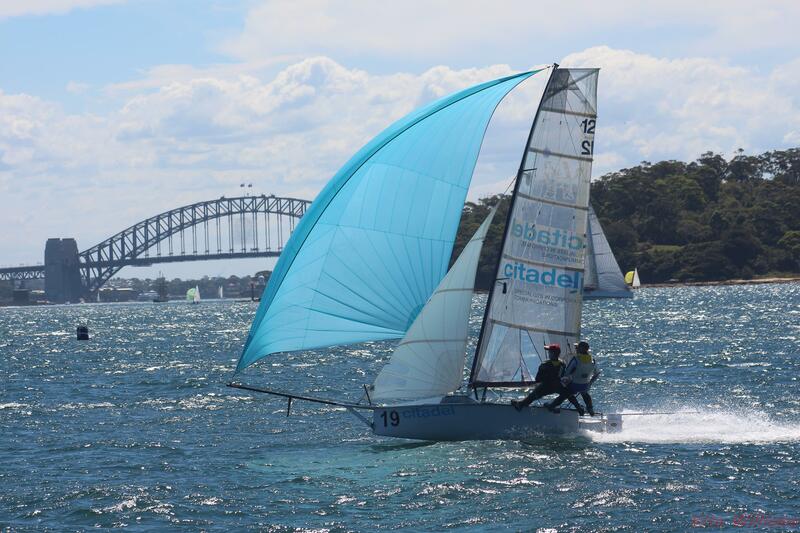 Thanks to all Woollahra Sailing Club for hosting the event, especially to all the volunteers that gave up their long weekend. 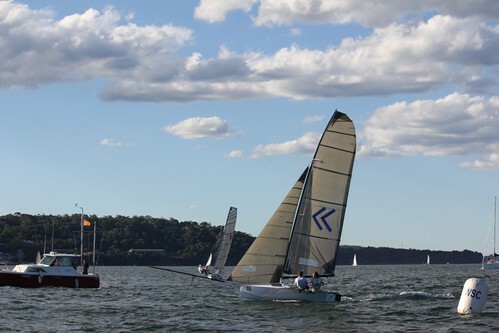 Heats 4 & 5: Australian 12ft Skiff Titles second days racing saw the ever consistent Garde (Brett Hobson and Alex Johnson) seal the overall regatta victory with a first and second, giving them the Championship with a race to spare. 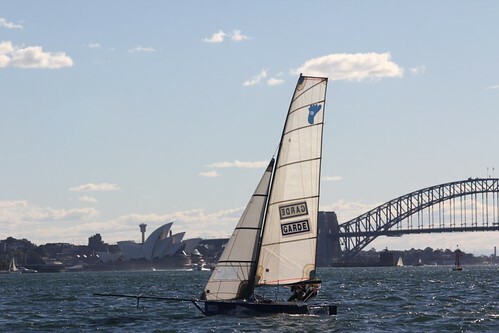 It also saw the first heat winner other than Garde, with Gemmell Sails, sailed by Murray ‘twinkle-toes Press and Ben Gemmell taking victory in a closely contested race five. The forecast 10-15 knot saw the usual rigging park anxiety, with the customary sledging in the anxious time when the rig choice is decided. All the fleet finally chose big-sail. 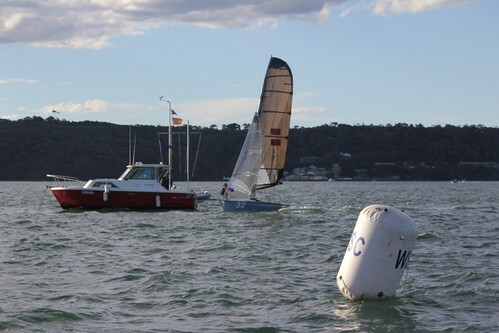 Format was a laid-mark 2 lap windward-return, followed by a shortened North-East course, to Beashel Buoy twice. Start of race four saw a swing left in the last 30 seconds before the gun, leaving the fleet just crossing the line on Starboard and bunched on the pin. The front runners headed to the western shore, with the bulk of the fleet going east into Nielsen Park, keeping the whole fleet tight when they re-bunched half way up the work. Into the top mark it was Garde, followed by Gemmell Sails, then Lincoln Crowne and Company (Jonathan Temple and Richard Jones) then PB Towing (the first of the Queenslanders, sailed by James ‘skinny’ Flemming and Tristram Hamilton). Down the square run, the whole fleet gybing back and forth across the harbour seeking pressure. At the bottom mark it was Garde ahead of Gemmell Sails ahead of LCC then PB Towing. Up the last work these places maintained, with Garde extending slightly. On the final run PB Towing pulled deeper and passed LCC into third, with Skol in fifth, this being the order of the finish. 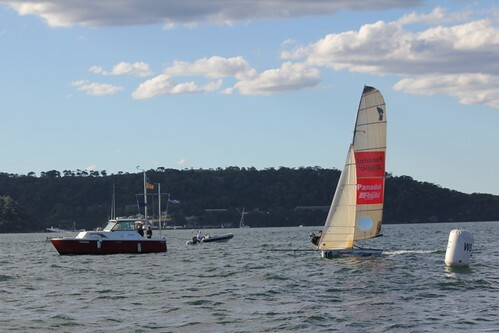 Race 6 was the longer course to Beashel Buoy, a little fresher than the first race. From the start, most went left to the western-shore, where a Manly ferry pushed Garde back to the right, with Gemmell Sails crossing the ferry to take the western shore. ½ way up the work it had settled in to a tussle between Garde, Gemmell Sails and Lincoln Crowne, with Giddy-up (Queensland, Paul O’Malley Jones and John Cole) right on their heels, with less than 50m between these 4 at the top mark. Down the square run, Garde and Gemmell Sails went to the West, LCC stayed in the east and found some pressure keeping them in the running. This group was closely followed by PB Towing, all the fleet getting good depth with the big spinnakers in the building breeze. ‘Twinkle-toes’ Press made his move on this run, eating into the small lead that Garde held, gaining a small lead at the bottom mark. Up the final work, with the breeze kicking in to 14 knots getting the big-rigs right to the top end of their wind-range. Garde struggled in the increased pressure more than Gemmell Sails, letting ‘Twinkle-toes’ stretch their lead to a comfortable margin, with 50 m between second and fourth. 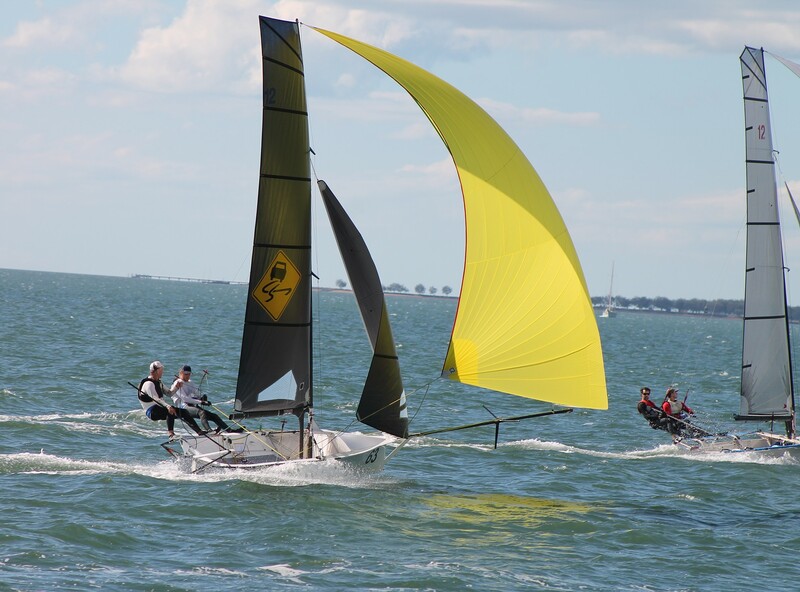 Heats 2 and 3: The forecast 20-30 knot with the suggestion that it would ease through the afternoon to 20 knots saw the fleet nervously deciding rig-combinations on the beach, and watching the wind-strength readings up to 30 knots at the airport. This saw the choice being predominantly 4th rigs, with smaller mains and jibs setup and a smaller spinnaker rigged. Out to the start of race 2, lots of upturned skiffs between the club and the start-line as people became used to the conditions. The 2 races were both taken out convincingly by Garde, sailed by Brett Hobson & Alex Johnson, stamping their imprimatur on the series with 3 wins from 3 starts. 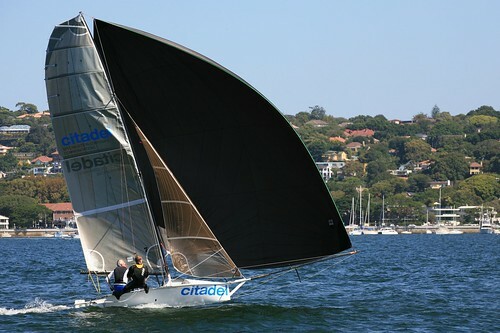 Race 2, 3 laps windward-leeward Rose Bay to Taylor Bay got away cleanly, with Garde leading around the top mark, followed closely by Skol, (Peter Polec and Jamie McCrudden) then Giddy up (Paul O’Malley Jones and John Cole), then Lincoln Crowne & Company (Jonathan Temple & Richard Jones). Very fast and wild ride across the bumpy harbour reach to Taylor Bay, places unchanged for the start of the second work. 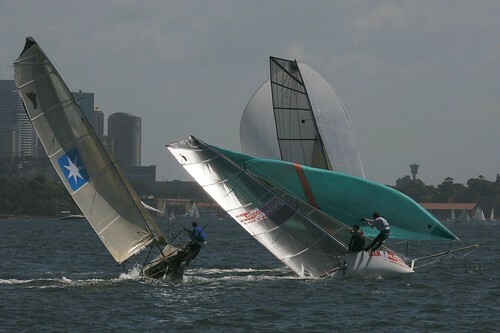 The conditions were beginning to take their toll on the fleet, spread out across the harbour, with a number of upturned hulls indicating stories to be told, and both Geotherm (Scott Hobson and Damian Vlotman) and D-Unit (Adam Forbes and Richard Johns) destroying their rudder outriggers taking them out of the race. The final run to Taylor saw Garde with a commanding lead over LCC with Gemmell Sails (Murray Press and Ben Gemmell), and Skol hot on the heels. Gemmell Sails and twinkle-toes Press outsmarted LCC on the finish, to take 2nd by 3 seconds from LCC, with Skol 4th. 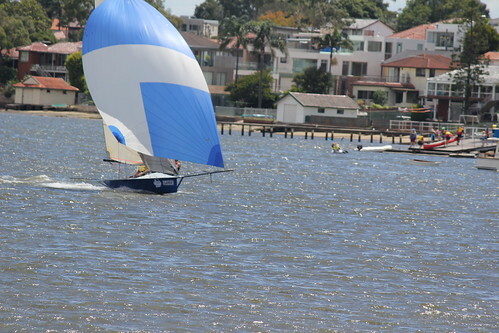 Race 3 followed directly after race 2, a shorter 2 lap windward Leeward with a shortened work. Away clean in pressure, with the usual crowd leading up the work, with only Brett on Garde having the nous to have noted the severely shortened leg and the relocated top mark, giving them a clean rounding and the bulk of the fleet having to reach down to the mark, and commence the long chase to catch the now-distant Garde. Some bedlam down the run saw a number of the frontrunners down the mine, leaving Skol and LCC to round together, having telescoped the massive lead that Garde had begun the run with. The second work followed the form of the first, Skol dropping off the pace a little, allowing LCC through to 2nd, and this was the order of the finish. The starters boat had a spread of wind readings from 16 to 35 knots over the afternoon, and noted that Garde completed the one mile plus run in under 4 minutes. Race 4 & 5 tomorrow forecast massively different, big-rig looking like the call for the day. Heat 1: Forecast 12-14 knot, fleet on the beach, marginal big and second rig. The scene on the water persuaded all to go with big rig; 35 minutes from the start a gust came through and a welter of big-rigs were pulled out for a mad rig-change. Only Commodore Ben and Nick Barnyard had had the foresight for 2nd sail from the beginning. Start saw the fleet line up with marginal 2nd rig pressure, away up the starboard beat to the west shore saw the few big-rig boats looking good, led by Fungus and Clewie on Kiroshi. The fleet was lead by the usual suspects, Gemmell Sails & Garde path-finding, with Lincoln Crowne & Company yapping at their heels. In the final approach to the Beashel bouy the top order was interrupted with Arrogant Frog, having a blinder of a work with the big-rig, Geotherm finding breeze in the East and pushing into the order along with Nick Barnyard on Hey Charger. The crowd at the mark-rounding, Gemmell Sails first by a whisker, with Geotherm , Lincoln Crowne, Garde, PB Towing and Kiroshi all overlapped. Murray & Ben bolted down the run, clearing out to a tidy lead, leaving the pack to get all over each other. Through to the Shark Is gybe-mark, all overheated and pressed, closing on Gemmell, who bolted again after the gybe. Bottom mark, Gemmell Sails again a good gap, followed by Garde then LCC. After the rounding, Gemmell broke their trapeze strop, dumping them in the water, and causing twinkle-toes Press to break the tiller-extension in the process. This handed the lead to Garde, Kiroshi coming into 2nd as LCC snarled their halyard in the drop. Up the work, in this order, patchy breeze coming in and out of 2nd rig pressure. Hey-Charger and Kiroshi fell off the twig, with the fleet starting to spread out. On the square-run, Garde had a 200m gap, using this margin to gybe several times to cover PB Towing & LCC. At the bottom mark for the last time, Garde leads by 30 seconds, LCC 5 seconds ahead of PB Towing, with Geotherm a further margin back, just ahead of D-Unit then the limping Gemmell Sails. This entry was posted in Race Reports and tagged Woollahra on April 8, 2012 by Karmen.